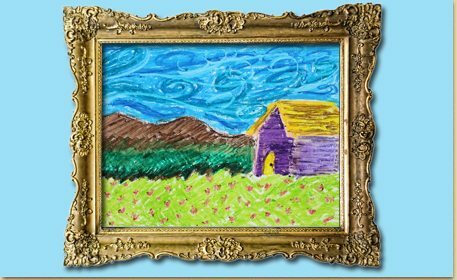 Use oil pastels to create a beautiful landscape picture inspired by the impressionist painters. To make the foreground grass, start with a light green Oil Pastel. Make several long strokes in one direction, and then make several long strokes moving back in the opposite direction. This will give the grassy area texture. Continue making long strokes across the paper to complete the grassy area. Create a field of poppy flowers in the grass using the red Oil Pastels to create the flowers. Using a light colored Oil Pastel, draw a little house on one side of the picture. Start adding color to the house. Use the end of the Skinny Stick to scratch through the color on the paper to add texture. To finish the house, add some darker color to the top of the light color on the roof. With a brown Oil Pastel, draw some hills above the grassy area. 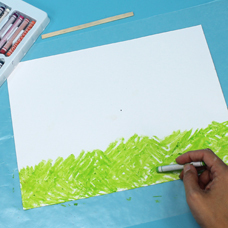 Following the technique used in Step 2, use darker green Oil Pastels to create another grassy area, as shown. The house and the dark green grass are the middle ground in our landscape picture. Using long strokes with a dark brown Oil Pastel, fill in rest of the hills to make the background of your picture. To make the sky, take a medium blue Oil Pastel, and make large swirls across the sky. Finish coloring the sky with a light blue Oil Pastel. Use the end of the Skinny Stick to scrape through some of the oil pastel in the sky. This project is inspired by the many landscape paintings done during the impressionist art movement. Have your child or student look at the work of great impressionist painters, such as Van Gogh, Monet, and Renoir. In our landscape painting, we have a field of poppies in the foreground, a house and dark green grass in the middle ground, and hills in the background. You can review our lesson on Foreground, Middleground & Background here.